Join the greatest heavy metal band to ever terrorize an audience, the all-mighty GWAR, as they rampage through the past to catch Mr. Perfect and shut him down for good. One part revenge, two parts bloodlust, all parts GWAR craziness! See GWAR's influence on modern technological inventions, watch GWAR kill more historical dead guys, and drop in on a very special 1990s talk show episode taping. 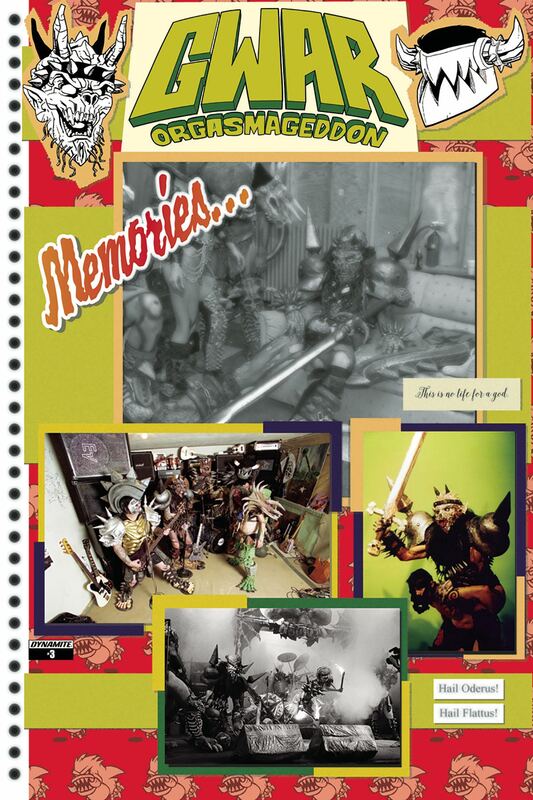 That's right, this is the issue you demanded: GWAR of yesterday meets GWAR of today and things are gonna get...emotional. Featuring story by sappy mess Matt Miner, GWAR's Matt Maguire, and art by Jonathan Brandon Sawyer and members of GWAR, 2017's most incredible comic finds a heart underneath the piles of rotting flesh and gallons of spew.